Blueberries are $1.30 for a pint at our local supermarket! I bought a couple pints and plan on freezing some for those lonely winter months without a fresh berry in sight. Plus, I need to start thinking about literally storing up for winter as we will have a brand new baby to feed around the clock during the holidays, on top of everything else that will need to be done! I’m thinking these muffins will be perfect to freeze and gently warm in the oven when we need breakfast, yet don’t have the brain capacity to read a recipe. I made these last week from the New Best Recipe cookbook and they turned out magically perfect. 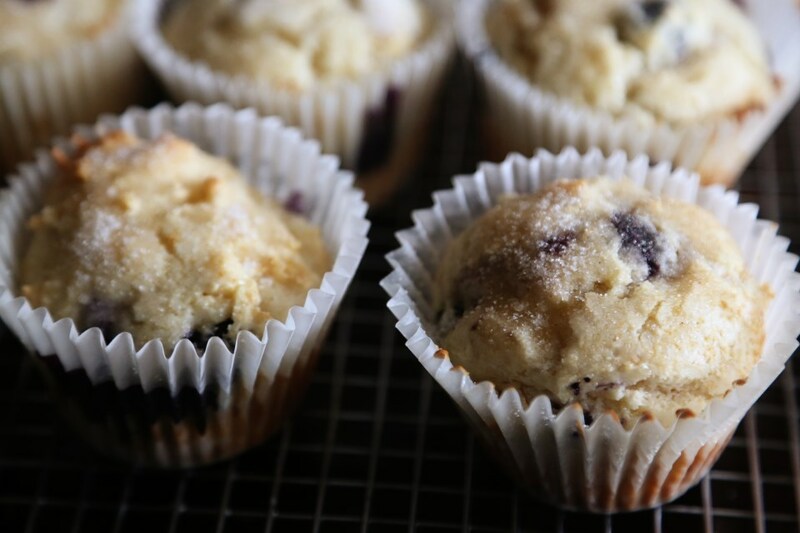 I used fresh instead of frozen, as the recipe suggests, and I indeed had “explosions of tart berries throughout the muffins” but I certainly didn’t mind. 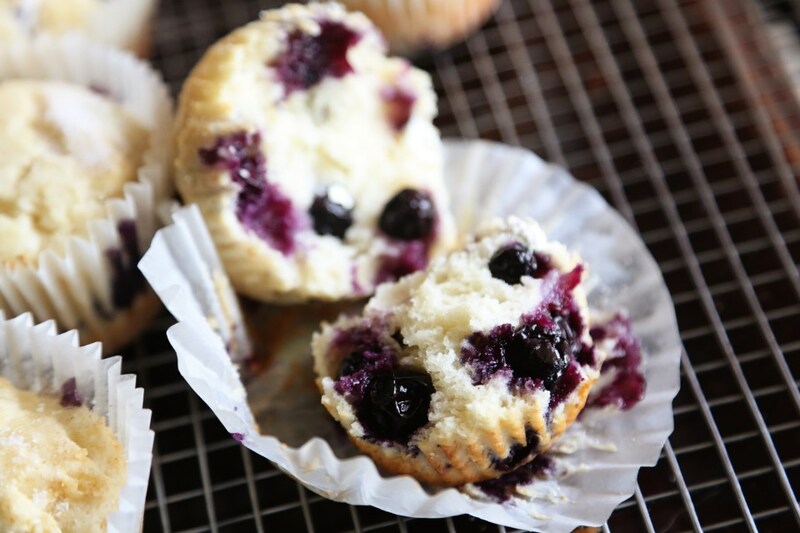 Because the recipe was testing in the winter when blueberries were out of season. The blueberries in the store now taste like…blueberries! So grab them while you can and whip these up for breakfast tomorrow morning! I brushed these with melted butter and sprinkled them with cinnamon sugar for a little extra love. Adjust oven rack to the middle position and heat the oven to 350 degrees. Grease a 12 cup muffin tin or line with papers, like I do, because I live in terror of baked goods sticking. Whisk the flour, baking powder, and salt in a medium bowl. Whisk the egg in a separate medium bowl until well combined and light colored, about 20 seconds. Add the sugar and whisk vigorously until thick and homogenous, about 30 seconds; add the melted butter in 2 or 3 additions, whisking to combine after each addition. Add the sour cream in 2 additions, whisking just to combine. Add the berries to the dry ingredients and gently toss until they’re all coated. Add the sour cream mixture and fold with a rubber spatula until the batter comes together and the berries are evenly distributed, 25-30 seconds. Don’t overmix, some spots of flour will remain. Scoop into the muffin cups about 3/4 of the way full. Bake until muffins are light golden brown and a toothpick comes out clean, about 25-30 minutes, rotating the pan about halfway through baking time. 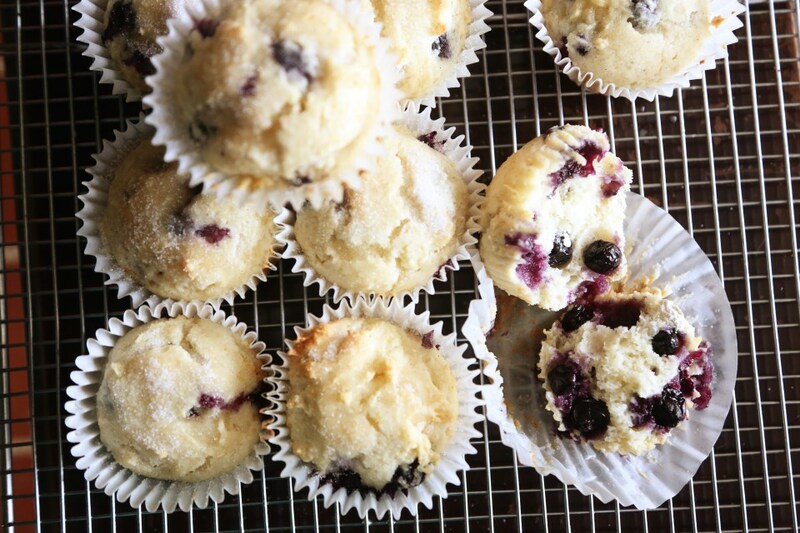 Dump the muffins onto a wire rack, stand the muffins upright and let them cool 5 minutes. Serve as is, or brushed with butter and dipped into cinnamon sugar. You win either way. *taken from The Best New Recipe. This cookbook will make you look so, so smart. This entry was posted in Baked Goods, Breads, Breakfast, Fruity, Uncategorized, Weekend Fare. Bookmark the permalink. These look wonderful, but I’m wondering if the temperature for the oven is right…250? Really? Ooops! Thank you for catching my typo, Betty! 350! Okay, so when do you want to move back home and live with Mom again?